Peak Wide Stand Microscope is a simple measuring microscope designed to be compact and light weight, but characterized by a wider field of view than that of the conventional microscope. It allows not only to provide magnified view of fine pattern and contour of objects, but also to measure length and compare dimension by using a scale included in the eye-piece. Focusing by a smooth rack and pinion with knob on both providing a smooth action. 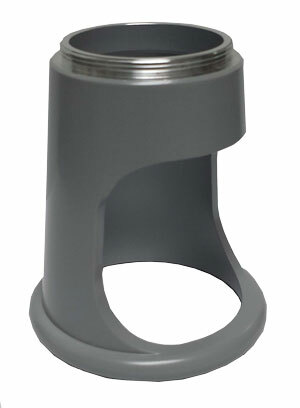 The 2054 Peak Wide Stand Microscope II CIL/Coaxial incident light source as its feature. 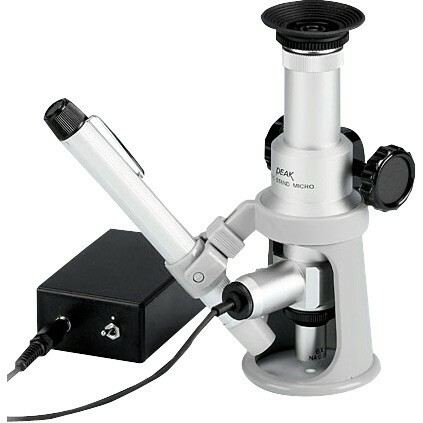 The 2064 Peak Wide Stand Microscope II CIL/LED with a LED light source as its feature. Peak Wide Stand Microscope will be useful not only for the general observation but also for improving accuracy in precision machining and securing uniform quality in the inspection process. 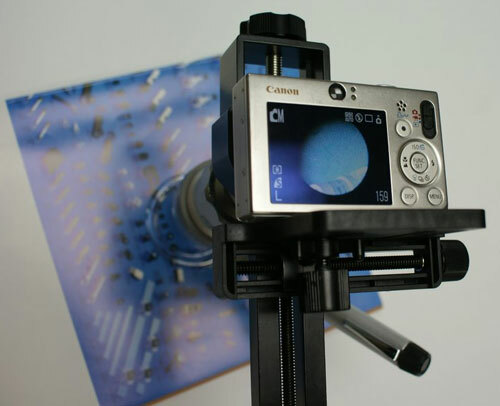 2054-2064 series Wide Stand Microscopes can be attached to a digital camera. 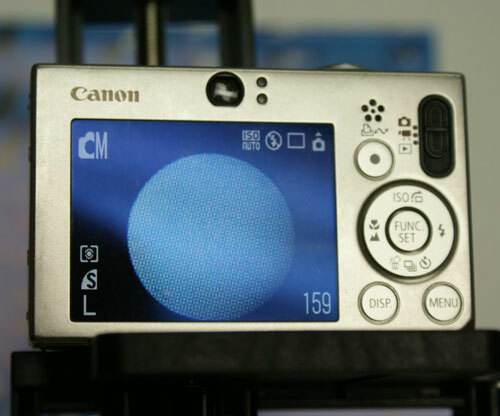 Interested in capturing images with your digital camera. See the below camera mount section for adapters and attachments. The LED light is used as a lighting source for coaxial incident light illumination. 40x, 60x, 100x, 150x, 200x and 300x models are available. Focusing possible by rack and pinion system. 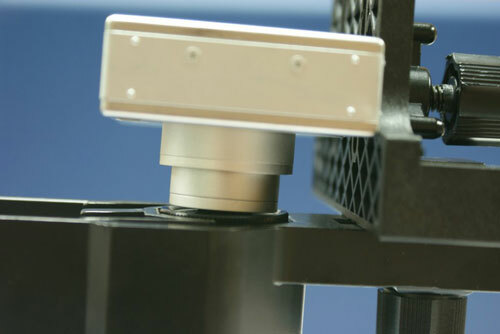 The Universal Mount uses the camera's tripod thread to attach the camera. Micrometric X-Y controls make for quick and precise optical alignment over the microscope eyepiece. 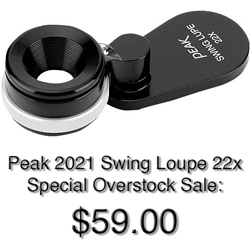 The lens is positioned to just meet the eyepiece for excellent quality photographs. 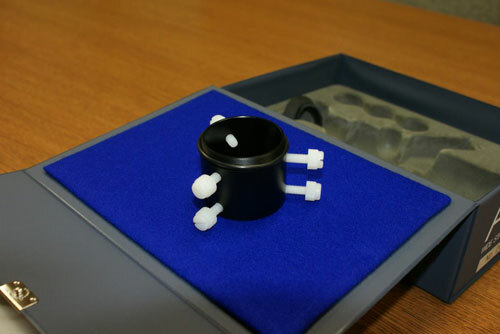 The mount is held on to the microscope with a rubber padded non-marring clamp. Constructed of aluminum and rigid composites for very stable mounting. Net Weight 237~241 gm. 263~267 gm. 263~267 gm. 393~394 gm. Magnifiers with reticles are not supplied with certification certificates. Certification if required must be sent to a certification lab. Buyer is responsible for the source and cost. Description of Lighting Systems Shown Here. To change magnification on a existing magnifier. To change magnification, change the objective lens and buy the 10 eye piece with the respective reticle installed. Having the reticle installed at the factories clean room to eliminate any chance of dust on the reticle. The eye piece is 10 power and contains the reticle. Reticles available are shown below, larger view shown here. When buying reticles it is recommend that the reticle and the eye piece be purchased together eliminating the problems of dust particles on the reticle. For items that are priced over $1,010.00 two or more of the same item must be ordered to receive the discount.